A completely natural solution for infections of any kind, A gentle, yet effective, natural antibiotic completely free of side effects. It does not harm the healthy bacteria in your gut. Effective against around 650 different organisms. For those who wish to use Colloidal Silver as a mist, we offer a small, 60ml, convenient to carry, spray bottle. Supplied at the cost price of £0.80 when ordering 250ml Colloidal Silver. It is not available with the 5L & 15L products or separately. Effective against around 650 different organisms compared to the 6 of a pharmaceutical antibiotic. It is safe for adults, children and pets and can be used during pregnancy, Colloidal Silver can be used both topically and internally. 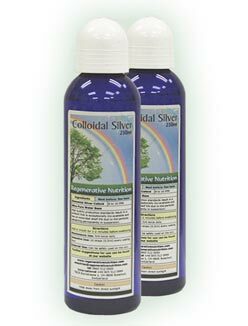 We supply a pure, high quality, ionic colloidal silver in the range of 8-10 parts per million, this ensures a safe and effective product that gives the best results. Produced by advanced electronic equipment giving a very small particle size of 0.01-0.001. The result is a clear to very pale amber liquid for optimum absorption and an indefinite shelf life. Natural and pure, free from any artificial additives, preservatives, flavourings, sweeteners and GM ingredients. Elemental Silver colloid 8 to 10 parts per million. Particle size 0.01-0.001 microns, in a base of ultra pure water. This product is the result of a high voltage pulsating current produced by astutely engineered electronic equipment. The resultant product is exceptionally bio-available and has an extended shelf life, since the particles remain permanently in suspension. In times of extra need, up to 25ml daily. In very serious health conditions, doses up to 500ml may be taken safely, as colloidal silver is not retained in the body. Small amounts taken frequently throughout the day is an effective and economical way to take Colloidal Silver as the bulk of it is absorbed in the mouth. Example: 1ml or 1-2 sprays in the mouth every waking hour, then held in the mouth for a minute or two before swallowing. The 300ml bottle we supply now comes with a spray top to facilitate this most effective and economical use. If fatigue follows use, this is just a "die off" reaction of undesirable micro-organisms such as the Candida parasite. Zell Oxygen or Zell Immunocomplex can assist with this, making it quicker and easier as well as improving cellular oxygenation and boosting the immune system. With so many organisms now resistant to antibiotic therapy, and the growing awareness of the numerous, damaging, side effects of these drugs, more and more people are turning to Colloidal Silver. However, as awareness grows of the limitations and dangers of antibiotics, the profit threatening re-discovery of Colloidal Silver has become apparent to the major pharmaceutical manufacturers. So, due to legislation funded by these pharmaceutical giants and supported by blatantly false propaganda distributed by these same vested interests, it is now illegal to sell Colloidal Silver for human consumption in the EU. We supply a high quality, ionic colloidal silver product. We still manufacture this product, to exactly the same high standard, using exactly the same methods, but now we can only supply it for household and animal use. By purchasing it you acknowledge these limitations of use. Colloidal Silver is one of the oldest remedies in the world and can be traced as far back as the ancient Greek and Roman Empires. It is a non-toxic, non-addictive infection fighter free of side effects. Colloidal Silver is thought to kill an average of 650 different organisms, compared to the 6 of a standard antibiotic. It is safe for adults, children, animals and pregnant and nursing women. It can be applied topically and used internally and has no reaction with other medications.In the early part of this century Colloidal Silver was used as a mainstream therapy until modern antibiotics came along. It was the primary infection fighting medium used by the wealthy before the advent of penicillin. Colloidal Silver is a completely natural substance, we supply a pure, high quality, true colloid with silver particles in the correct range, this ensures a safe and effective product that gives the best results; this is not true of all preparations on the market. Early, pre-war manufacturing techniques were expensive as well as less efficient than today's methods; the silver particle size never reached its optimum ultra-microscopic size. The highest grade is produced by the electro-colloidal (as opposed to mechanical grind, ultrasonic or chemical) method where the silver particles and water have been colloided (dispersed within and bound to each other) by an electric current. This preserves the necessary homogeneity, minuteness of granules, purity and stability to create a true colloid composed of particles of ultra fine silver (about 0.01 to 0.0001 micron diameter), electrically charged and held in suspension in a solution of deionized water. According to the Colloid Research Foundation, the highest quality Colloidal Silver consists of the maximum number of particles of the minimum possible size with the ultimate solution having a huge number of particles of one atom, each carrying an electrical charge. A true silver colloid should not contain any artificial stabilizers or chemical additives of any kind, which can be present in some silver products on the market. Some even use artificial yellow dye to give their product the proper golden yellow colour of the true silver colloid. Darker colours indicate larger silver particles that tend to collect at the bottom of the container and are not true colloids. If a product contains a stabilizer or lists trace elements other than silver, or if it needs to be shaken, it is inferior. If a product requires refrigeration, some other ingredient is present that could spoil. High concentrations of silver will kill organisms quicker but not necessarily more effectively than the most effective range of 8 to 10 parts per million (ppm). In the 1990's further research was carried out at various US centres. Dr Margaret Bayer at the Fox Chase Cancer Centre in Philadelphia showed that the growth and spread of Lyme's Disease bacteria (Borrelia burgdorfen spirochetes) are measurably slowed or stopped by colloidal silver in vitro (Courteney, op crt, p. 27). Courteney also reports that at Temple University School of Medicine in Philadelphia Professor of Microbiology Dr Helen Buckly found that growth of several varieties of Candida Albicans (yeast strains) and several cryptococcus neo-formans strains were blocked by very small doses of in vitro colloidal silver.